Sunday July 12th 1896 I was through my work in time to go to church. I got some dinner and read and wrote all the afternoon. After an early supper Will hitched to the Surry and we went down after Ida and Nellie. It has been a very warm day. We visited awhile before bed-time. 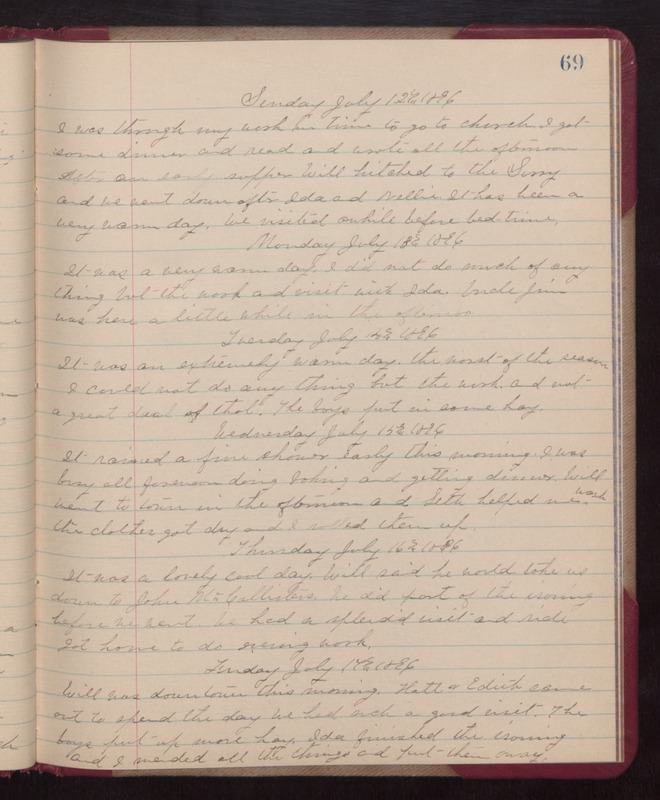 Monday July 13th 1896 It was a very warm day. I did not do much of any thing but the work and visit with Ida. Uncle Jim was here a little while in the afternoon. Tuesday July 14th 1896 It was an extremely warm day. The worst of the season. I could not do any thing but the work and not a great deal of that. The boys put in some hay. Wednesday July 15th 1896 It rained a fine shower early this morning. I was busy all forenoon doing baking and getting dinner. Will went to town in the afternoon and Seth helped me wash. The clothes got dry and I rolled them up. Thursday July 16th 1896 It was a lovely cool day. Will said he would take me down to John McCallisters. We did part of the ironing before we went. We had a splendid visit and ride. Got home to do evening work. Friday July 17th 1896 Will was down town this morning. Hatt & Edith came out to spend the day. We had such a good visit. The boys put up more hay. Ida finished the ironing and I mended all the things and put them away.